An 18th Century thatched character cottage. Living room with exposed beams, inglenook fireplace (wood burner) and bread oven. A brand new kitchen is now fitted and ,as from the end of May 2018, our new extension will be complete which will add a separate dining room to the cottage.The stairs lead from the living room up to three bedrooms – a pretty double with en suite shower-room (suite), a small bunk room (3’ beds), and one with two single beds. The second (main) bathroom is on the ground floor. A new paved outdoor sitting and dining area leads up from the small paved area outside the new dining room... Petrockstowe is : little far-from-beaten-track village (pub) in farmland a mile from the Tarka Trail. River Torridge (fishing), 2 miles; Fishleigh Estate (location of original ‘Springwatch’ series), 3 miles; Sheepwash (famous fishermen’s pub), 3; Hatherleigh (market town), 4; Rosemoor RHS Gardens 6, Dartmoor, 11; sea/beaches at Westward Ho! or Instow, about 15, or surfing at Bude, 20. We have owned Monks Cottage since 1998. I used to be a regional manager in the West country and when I took early retirement I wanted to keep a base in this beautiful county. We have updated the cottage ,whilst maintaining the cosiness and comfort you would expect from a thatched cottage with its old beams,inglenook ,bread oven and wood burner. I am a keen walker and fly fisherman, so Monks Cottage was ideal. We have rented the cottage out with a well known West country agency for many years-whilst using it ourselves at weekends mainly in the Winter , Spring and Autumn. Now we want to use it a little more ourselves whilst still offering all the facilities of a well-loved holiday cottage. This is rural Devon at its best-true farming country. It is far from the tourist beat and is the Devon of quiet country lanes and small white-housed villages perched on hilltops. On a good day you can see 7 of them from the top of our garden. Upstairs en-suite shower and w.c, with pumped shower. Ground floor bathroom with hand shower over bath, w.c. Exposed beams. Iglenook with bread oven and wood burner. Smart TV with full broadband ,DVD player with Speaker system for MP3 etc. Notes on accommodation: After a long campaign, by a group of villagers,Petrockstowe has been added to the list of those rural Devon communities that are to receive super-fast fibre optic broadband. We now have this installed with a Smart TV The property has oil-fired central heating and cooking is electric. We include these in the price but we do ask you to pay for logs. The first basket is free and then we ask £3.50 for each subsequent basket. Unfortunately,as I am allergic to cats and dogs WE CANNOT ACCEPT PETS.-Contrary to one of our reviewers-who described the cottage as pet-friendly(we do love dogs -but sadly can`t accept them in the cottage) This is a no smoking cottage-and if you are a smoker we do please ask you to do so outside. Outside: We now have 2 patio areas(one raised on the lawn and one outside the Dining Room) We have just built(June 2018 ) a log cabin at the top of the garden ,with outstanding views across the Torridge Valley and, on a clear day, Exmo Utility Room: Tumble dryer, high chair, iron and iron board Towels and Bed linen are included, and changed every week. Our housekeepers live only 150yards away and will either greet you at the property or arrange for the keys to be collected. 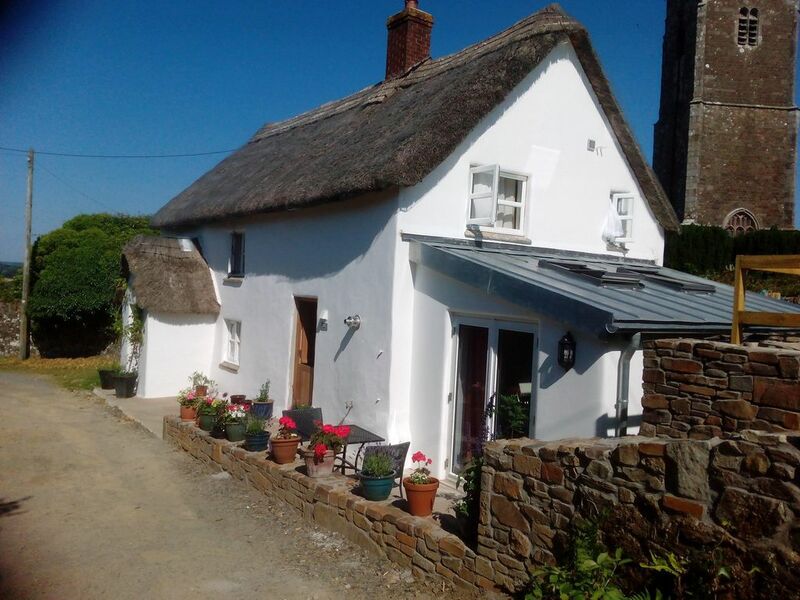 This thatched cottage is the ideal base when planning to tour North Devon. Very well maintained and spacious, it is situated in a very quiet lane in Petrockstowe with the village church right behind it. The only sound you hear is the church clock striking - wonderful! The cottage is fully equipped and has a parking space for the car. I would thoroughly recommend it and certainly plan to return next year. Thank you so much,we enjoyed having you as guests. Would highly recommend this cottage. It is very quaint and comfortable and if you are looking for peace and quite it is ideal (apart from the church clock that chimes regularly but you soon get use to it). Also an ideal location to explore Dartmoor and the surrounding villages. Very friendly pub just down the road that does nice food. Quality butchers on the road to Holsworthy which is reasonable and their sausages are a must. We all had a very enjoyable holiday and the weather was beautiful. The cottage was all that we had hoped for; quaint and old (nostalgic of my childhood) yet warm, cosy and with all modern conveniences. We felt at home immediately. The neighbours went out of their way to be friendly and helpful. Our celebration meal at the Laurels was delicious but we missed the warm open fire of the pub in Sheepwash. Petrockstowe was very central for day trips to (1) Cornish coast: Boscastle, Tintagel and Port Isaac were wonderful. (2) Dartmoor and Dartmouth (3) Exeter (4) Walking the Tarka Trail. The cottage was very well equipped and we were able to entertain friends and family and cook up a big meal for them. There were a few cobwebs and we did find a dehydrated dead mouse under the sofa cushions which didn't bother us but might bother someone else. Generally, the house appeared clean but if I'd been there long, I would have had to get into corners, clean and tidy cupboards and do something with the patio. Nevertheless, we were very happy and comfortable there and, yes, we would highly recommend the cottage to family and friends. If you want a peaceful week away then this is the place to visit. A beautifully equipped character cottage. Comfortable and cosy. This is country life at its best! Really enjoyed our week away. Booking Notes: We ask for a 1/3rd deposit at the time of booking and the balance 6 weeks before arrival. We prefer payment by Electronic banking transfers,but will accept cheques,if you are booking well in advance. We don’t accept Credit cards. Changeover Day: Saturday changeover for weekly bookings. Long weekends- Winter only. Notes on prices: We accept 3 night long weekends during the winter period for £195.00. All other periods are a minimum of 1 week,although we will take a 5/6 day booking (during the winter/autumn) when a previous long weekend booking has interrupted a possible 7 day booking.